Everyone has that momentthe realization that adulthood has arrived, like a runaway train, and there's no getting out of its way. From the hit Tumblr blog of the same name, F*ck! I'm in My Twenties perfectly captures the new generation currently testing the waters of post-college reality. Quick-witted and self-deprecating, the author pens irreverent missives, DIY diagrams, illustrations, and tongue… -in-cheek checklists that chronicle her experience as a twenty-something living in the big city. 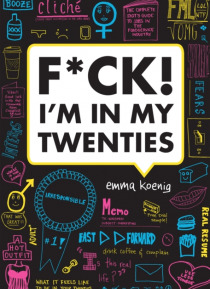 Including the best of her beloved blog, plus over 50% new material, this is a perfect humor impulse buy for anyone who has a love-hate relationship with their twenties.